In lieu of choosing - heaven forbid - an actual name for their newest creation, many car companies opt to assign letters and numbers to their wares, and we think it can be a little alienating (take McLaren's oddly named MP4-12C, for example). Car model nomenclature is far more important than you may think; a vehicle’s name is specifically designed to elicit a certain type of emotion from the target buyer’s demographic, and numbers don't cut it for some of us. That's just one of the reasons why we consider the newest Hyundai a breath of fresh air. Their all-new, three-door hatchback is called the Veloster. It's a unique name that hints at speed, sportiness, and, well, Jurassic Park tour vehicles. No matter what you think of the name, it's considerably more memorable than MP4-12C. Unfortunately, the two things we found the Veloster to be lacking in are speed and sportiness. Oops. Still, there are plenty of other bits about this car that are fantastic. The styling is smart enough to make you forget about that 0-60 mph time of 8.5 seconds (it's longer with their first ever application of a dual-clutch automatic transmission); the head-turning exterior is futuristic yet appealing, and the interior looks space-ship ready, especially with the remarkable amount of standard tech. But that's not all! 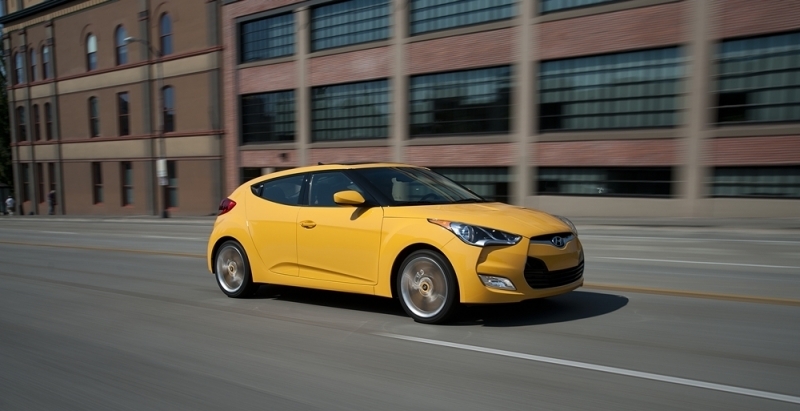 At $17,300, the Veloster presents a bargain for even the young crowd. Speedy, it may not be, but it does set the bar for the next-generation of compact cars. Styling is edgy, modern, and heralds a new direction for sporty compacts. The fantastic panoramic sunroof opens up the interior space, making it feel roomier. 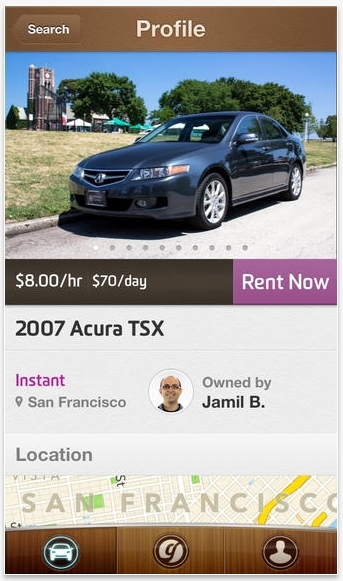 Simple pricing keeps the buying process from getting complicated, and the starting price is a steal. The three-door design always seemed a little awkward, yet this one’s seamless integration into the design works really well, giving passengers easy access to the rear without compromising the vehicle shape. 40 mpg highway is incentive enough. Headroom in rear is unsurprisingly cramped thanks to the sloping roofline. A split rear windscreen helps with visibility but doesn't completely solve the problem of a limited sightline out the rear. Acceleration is underwhelming - buy the turbo model if this is an issue. Steering wheel doesn't telescope. The Veloster isn't going to break any land speed records, and that might have been purposeful on Hyundai's part since the Veloster Turbo is waiting in the wings. Its 0-60 mph time is just 8.5 seconds, so prepare for Mini Coopers and the like to beat you off the line. Once it gets going however, the Veloster feels lightweight and nimble on the road. The manual transmission (our recommended gearbox choice over the dual-clutch) is easy to control and provides smooth shifts. Suspension is stiffer than other compacts on the road, and while handling is impressive, rough city streets may have you regretting your purchase decision. 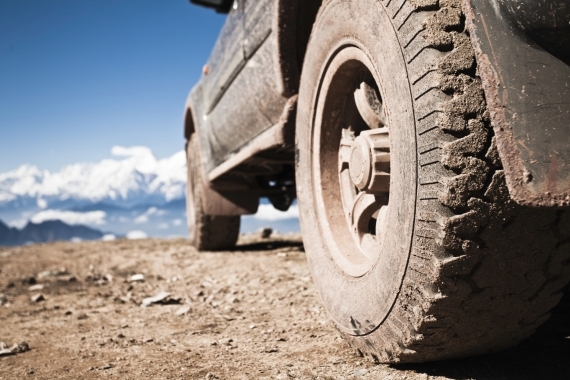 Steering is quick and pliable, making tight turns easy. And really, the cabin is very comfortable and quiet. The 1.6-liter four-cylinder GDI engine produces 138 horsepower and 123 lb-ft of torque that moves the car along at a speed slightly faster than glacial pace. The GDI engine feels torquey and delivers low-end power that keeps things interesting while traveling in tight corners. We tested a Veloster with the smooth-shifting six-speed manual and were pleased with the ease with which it grabbed gears. A six-speed dual-clutch automatic transmission is also available, a first-time application for Hyundai. With it, paddle shifters are an option. Thanks in part to the efficient GDI engine, the Veloster returns a stellar 40 mpg highway and 28 mpg city with the manual transmission. Ironically, the "EcoShift" automatic is less frugal on the highway - at 38 mpg. Both manage a combined 32 mpg without assistance from a hybrid drivetrain. Hyundai’s Eco Coach system uses graphics to demonstrate your green driving and will even recommend ways to improve fuel economy. 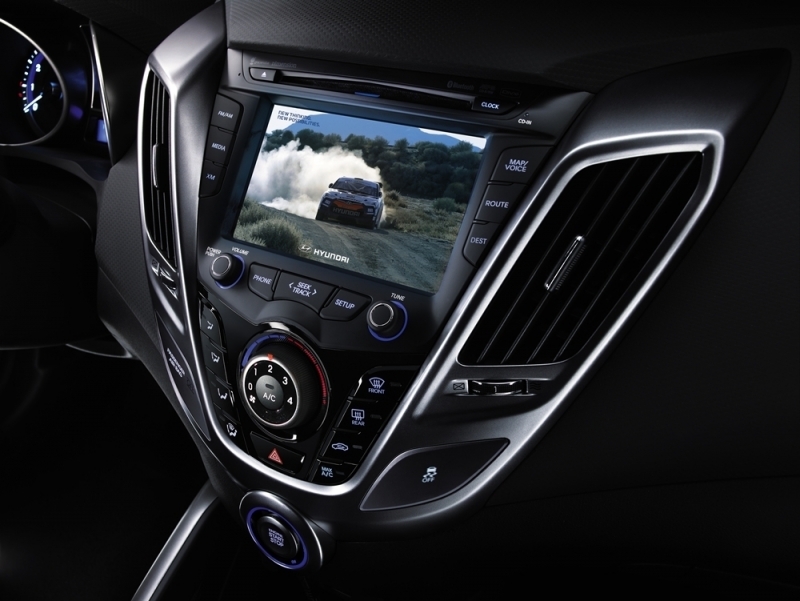 As is now typical with Hyundais, this car has more technology integrated within the cabin than cars twice the price. USB and auxiliary input jacks are standard, and iPods can be seamlessly connected to the voice-activated controls. The seven-inch touchscreen's graphics are some of the best in the industry, certainly for a car in this price range. Navigating through the system's menus is simple, and - would you believe? - the entire layout is rather intuitive. 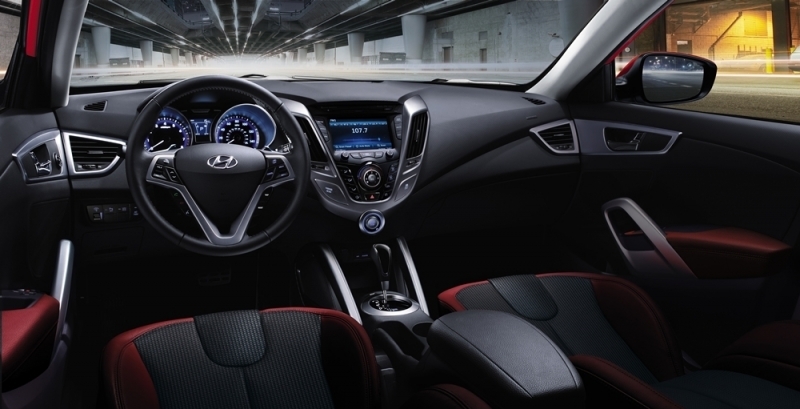 The Veloster comes stocked with a crisp, 450-watt Dimension sound system with eight speakers and an eight-inch subwoofer. Pandora can be streamed through the system as well. If that's not enough tech for you, bring your own; there are two cigarette lighters and a two-prong outlet. For an extra $2,000, the Style package adds a panoramic roof, as well as a variety of interior and exterior upgrades like 18-inch alloy wheels and piano black accents. The Tech package ($2,000) hooks you up with navigation, a backup camera, and auto headlights (a feature we feel should be standard). We're in major like with the Veloster's cabin space, which manages to feel roomy despite its diminutive proportions with the help of a large panoramic sunroof (part of the Style package). Bolstered front seats are supportive. Like the Mini, there's only room for four in the Veloster, and the two rear seats are comfy for people under six feet tall. 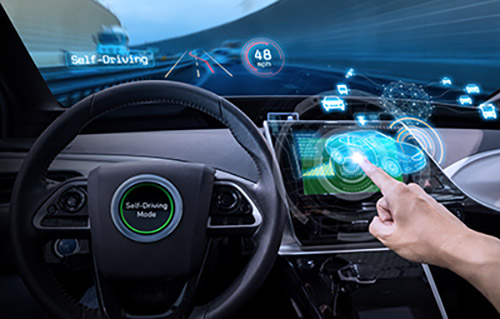 The futuristic center stack is the crowning achievement of the car's layout, containing the impressive touchscreen, as well as the engine start/stop button placed centrally. 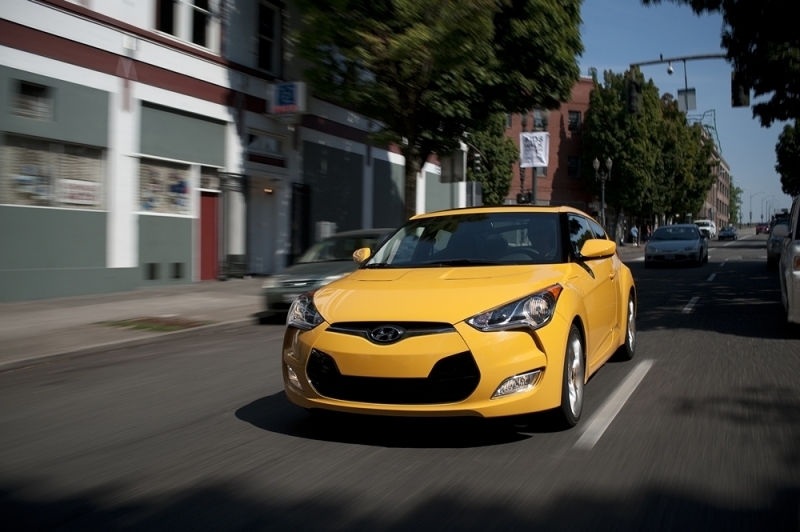 Despite its size, the Veloster houses plenty of cargo space in the rear as well. It's no Ford Taurus, but it'll do for grocery shops and trips to the airport. The Veloster is one good-looking car. And that's not because it looks sleek and expensive (though it does that as well), it's because the attention-grabbing design is so different that you’re compelled to turn your head. We're particularly fond of it paired with the brighter paint colors for maximum impact, but the bodylines work well no matter which color you choose. The third door is hidden so well that it doesn't distract from the overall shape. It’s nice to see a new take on the traditional hatchback design. 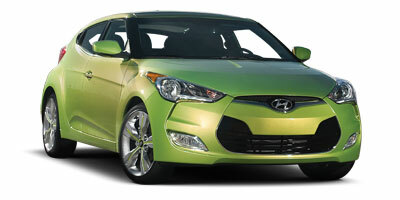 The Veloster is up against an array of sporty two-doors, and happens to be outpaced by all of them off the line. We'd argue that it's the better looking of them all, and the most technologically savvy. It starts at $17,300, and you'd be hard-pressed to push the price above $24,000 even when going option-crazy. It bests the prices of the growing collection of small, sporty competitors like the aforementioned Mini Cooper, the Scion tC, Honda CR-Z, and Mini Cooper Clubman. The niche group of buyers looking for reasonably priced, sporty compacts generally swoons over a few key selling points, like the latest technology, low base price, and cool looks. Hyundai's most recent offering certainly checks those off the list. And its only major disappointment - underwhelming acceleration - isn't even an issue with the advent of the Veloster Turbo. Hyundai is still building its brand presence, therefore many people won't initially head to their dealerships, but the Veloster is something special and worth a look from buyers - even those who've been drinking the Mini Cooper Kool-Aid.